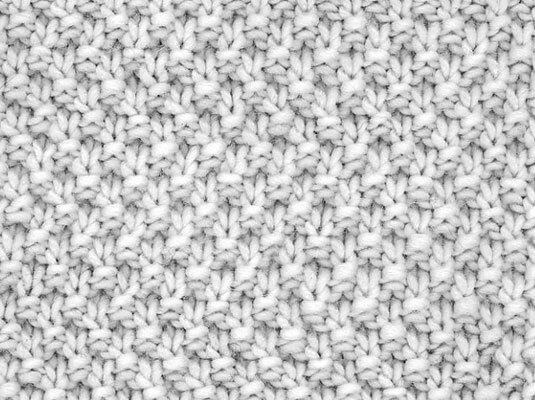 Moss stitch is an elongated version of seed stitch. Instead of alternating the pattern every row (as you do for seed stitch), for moss stitch, you work 2 rows of the same sequence of knits and purls before you alternate them. Cast on an uneven number of sts. An uneven number of sts makes this pattern symmetrical — either side can be the right side. Rows 1 and 4: K1, * p1, k1; rep from * to end of row. Rows 2 and 3: P1,* k1, p1; rep from * to end of row. Repeat Rows 1–4 to create the pattern. Knitting is really nothing more than pulling a series of loops through loops. How you pull the loops — the direction of the needle, the order in which you work the stitches, the colors you incorporate, and so on — contributes to the wide variety of fabrics that you can create.